On the 15th hole yesterday at Augusta, Tiger Woods nailed the flagstick on his approach shot and his ball then went into the drink. He then took a drop but he broke the rules in doing so. In the case of a water hazard, a player is allowed to drop the ball in a designated drop zone, drop the ball in the original sport where it was hit or drop it in a direct line from the flag to where the ball hit the water. As Jay Busbee points out, he combined the latter two options. Since Woods had already signed his scorecard without an two-stroke penalty for an improper drop, as per the rules for signing an incorrect scorecard, the result would be a disqualification. Of course that's a ridiculous rule, but it is the rule. But due to some other rules, Woods was not disqualified this morning, only given what should have been the original penalty of two strokes and is now at -1 and will tee off today at 1:45. However, there have been calls for Woods to withdraw himself, including strong words from two-time Masters champion and CBS/Golf Channel analyst Nick Faldo and from fellow Golf Channel analyst Brandel Chamblee. Both state that Woods knows he violated the rule and therefore should pull out. While I do think that Woods should have been disqualified no matter how absurd the rules are, I would not go far enough to say that he should withdraw. As I have made clear, we all know that golf's rules are pretty ridiculous but that is just the way golf is. And while Woods was able to take advantage of some wiggle room to avoid a disqualification, I do not have any doubt in my mind that the fact that he is Tiger Woods helped him stay in this tournament. The Masters has a history of giving big names the benefit of the doubt and I feel had this situation happened to, say, John Senden, he would not be playing this weekend. But I'm just not sold that Woods should withdraw himself from this tournament. I know that golf is considered to be an honorable game, a self-policing game in which players are thought to be able to call penalties on themselves, despite the costs of doing so. But the tournament has decided that he has not been disqualified and essentially took the blame themselves for the issue. And that is what I really think is key, this was a failure on the part of the tournament and particularly the official on the scene of the incident, who did not note any violation until after the fact and after Woods signed his scorecard. Woods does not escape his share of the blame because he did not know the rule, but I am not necessarily certain that Woods was knowingly out to cheat the system and give himself an advantage, as some have suggested. What really is a shame is that this controversy will overshadow and essentially mar what happens the rest of the tournament. If Woods goes out and wins, many will want to put an asterisk on the win due to the fact that he should have been disqualified. 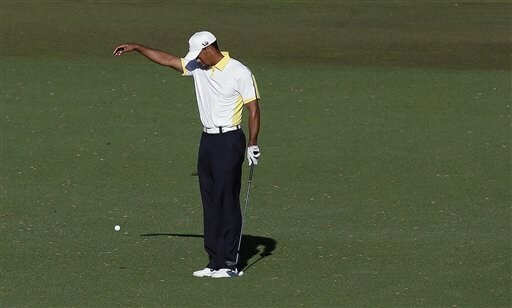 But if Woods does not win, many will point to this controversy as the reason why. And if Woods had withdrawn or had he been disqualified, then the winner of the tournament would have to run parallel with the fact that Woods was not in the mix. So in essence, by the Masters' own fault essentially, nobody wins.